Our Kitchen crew is an amazing team of men, women, and young adults who make the delicious food that keeps ending up on the camper’s “favorite things about camp” list. There is always enough and the camp food made with loving hands is just one more aspect of camp that helps our campers feel loved and special. Responsible For: Helping to prepare and serve meals and take care of the kitchen. Spend time alone with the Lord everyday; be in the Word! Pray together with kitchen team. Be on time for your shift and be sure that things are completed before leaving. Help Food Service Director (FSD) prepare food each day. Clean up kitchen– put food away, clean counters, etc. CDO provides a free Day Camp experience for Kitchen Crew workers with children ages 2-12. Guardians must physically be serving at camp to drop their kids off for the Day Camp Program- otherwise known as the “Green Team.” The Day Camp Program runs from 7 am to 7 pm each day, and parents must REGISTER their children before dropping them off. 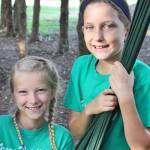 Be sure to notify the Day Camp leaders of any allergies, and what your schedule to volunteer is. Children need to be potty trained, or the parents will need to take care of changing diapers as needed (our young leaders are not allowed to change diapers). If you have any questions, contact Assistant Director, Grace Smith. Fingernails: Kitchen volunteers shall keep their fingernails trimmed, filed, and maintained so the edges and surfaces are cleanable and not rough. 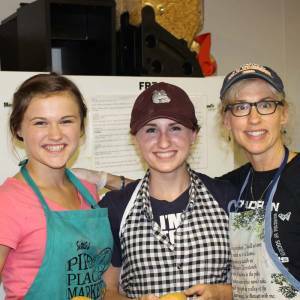 Jewelry: While preparing food, volunteers may not wear jewelry on their arms and hands. This does not apply to a plain ring such as a wedding band. Outer Clothing: Kitchen volunteers shall wear clean outer clothing to prevent contamination of food, equipment, etc. Hair Restraints: Volunteers shall use effective hair restraints to prevent the contamination of food or food-contact surfaces. Food Service Director will exclude a Kitchen Volunteer from the kitchen if the volunteer is diagnosed with an illness or who has symptoms caused by illness or infection.